According to Thornton, friends in the industry call him a “contrarian” - sometimes Geoff is on the cutting edge of new farming technologies and techniques, while in other cases he intentionally sticks with traditional varieties and plantings. Today, Geoff grows almost every apple variety including: Red Delicious, Golden Delicious, Gala, Fuji, Braeburn, Cameo, Cripps Pink and Piñata. Despite expanding his operation to 300 acres, Geoff is still involved in every aspect of maintaining his orchards. 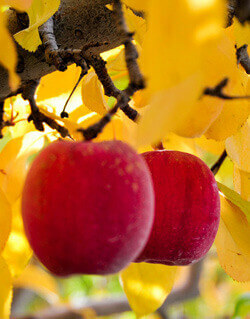 “A successful apple growing season takes tremendous attention to detail seven days a week. There are no “weekends” during the growing season.” says Geoff. Geoff’s family is involved in the orchard business – his wife Dianne has even spearheaded a new farm worker housing program to be operational this fall. Among many other credentials, Geoff is a past president of the Okanogan County Horticultural Association and Growers Clearinghouse Board.